(Newser) – A US military helicopter has crashed in western Iraq with seven service members on board, US officials said Thursday. 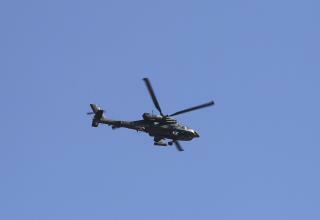 The officials said that so far there is no indication that the Pave Hawk helicopter was shot down. The helicopter is used by the Air Force for combat search and rescue, and was in transit from one location to another when it went down Thursday afternoon near the town of Qaim in Anbar Province, the AP reports. Officials said that rescuers were responding to the location, but other details were not yet available. It's not clear if there were any survivors. In a short statement, US Central Command said that "rescue teams are responding to the scene of the downed aircraft at this time," adding that an investigation will be started to determine the cause of the incident. The US-led coalition battling Islamic State insurgents in Iraq and Syria have an outpost in Qaim, which is located near the Syrian border. The anti-IS campaign accelerated through much of last year, as coalition and Iraq forces battled to take back a string of cities and towns. I'm sure that is exactly what happened. They never lied before.